This was another book that has been hanging out on my pile for about a year now. I recently received a copy of The Hanging Tree, the second book by this author. It prompted me to sit myself down and get going on this series that I knew I would love. 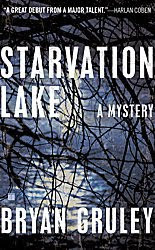 Starvation Lake is a mystery/thriller through and through. It is also the name of the town in which it all takes place. A small town in Michigan, it is a place that Gus Carpenter wishes he didn't have to come back to. He finds himself back in his home town as the editor of the local newspaper, The Pilot. A big story is about to break the town's thin surface and expose many of long time residents. One snowy winter night, pieces of a snowmobile wash up on the lake shore. It is the same snowmobile that belonged to Starvation's legendary hockey coach, Jack Blackburn, who disappeared and had been presumed dead. Gus Carpenter is a local boy with a love for hockey and a fondness for his old coach. Having played goalie in the River Rats, Blackburn's team, he looked to him as a father figure. Blackburn brought him and his friends, Soupy and Teddy, a bit of small town fame. The finding of his snowmobile on a lake five miles away from the one he supposedly drowned in brings up a lot of questions for Gus, as a reporter and as an old friend. It's hard to believe that this was Gruley's first novel. He weaves an intricate character sketch and a complicated yet compulsively readable mystery/whodunnit. I was impressed. His style reminded me of Dennis Lehane, another mystery author I love. It is obvious that Gruley knows about life in a town like Starvation, having grown up in a similar blue collar suburb near Detroit. Like Lehane, the town becomes a character itself and you definitely feel a part of the atmosphere and landscape; the bitter chill of Northern Michigan, the whispers of gossip at the local diner, the bureaucracy within the police department and the local government. The twists and turns surprised me. I didn't see where it was going and was not entirely happy with the ending but it did resolve what needed resolving. The people I wanted to pay, did in some way. It did leave me lingering a bit but really I wanted to read more of Gus. I grew to like him and like any book, I imagine my own visual of characters regardless of how the author describes. Don't ask me why but generally if an author describes a main character as blonde and rugged, I get an image of someone whoever might pop in my mind at the time. Gerard Butler? Okay! So for this one, I pictured Gus as Jake Gyllenhaal. ??? Mid thirties, loves his mom, athletic, serious, intense, independent, charming and still a little bit in love with the gal who got away. I saw Jake. Who knows? My only issue with this book aside from the ending was the major focus on hockey. It was a bit involved at times describing the game, the strategy, etc. Even though I grew up in and still live in the very cold state of Minnesota, I have never been a hockey fan. But I understood as a reader that the sport of hockey and the love of it was a huge part of the town's identity and Gus and his friends. I really enjoyed it overall. I was impressed with the sharp writing and intricate story line. It kept me guessing and intrigued. The ending I wasn't in love with but I was still wanting more of Gus. I look forward to picking up The Hanging Tree next. I do not know how many books are planned for this series with this character but I believe Bryan Gruley is an author to watch out for. Check out the website for the town below. It's pretty cool! I am happy to announce the winner of The Dressmaker by Posie Graeme-Evans! Winner has been notified and will have 48 hours to respond. Thank you all for entering and hopefully you will pick this wonderful novel up. thanking me for such a wonderful review! Happy Reading and Happy Thanksgiving and as always, thanks for stopping by! Well, I don't honestly know how I will get into another book right now because this one was so stunning, I know I will find myself dreaming of this story. As much as it puts a crimp in my reading schedule, I do enjoy those books that really knock your socks off so much that you have to let them settle for a few days before you move on. I am fresh from finishing this one, far from settling. I just closed the last page a few minutes ago, ran to the computer to locate Jennifer Donnelly's website and immediately "liked" her on Facebook. I limited myself to a brief enthusiastic blurb on her page (so as not to appear like a crazy fan!) on how much I loved it and then raced over here to write to you all. I just don't think I can do it justice. Andi was written with so much richness, energy, passion, edge, humor and sadness. You felt so strongly for her and with her and against her. The loss of her brother was so damaging and so understandable that even in the moments of absolute disregard for safety, you sympathized with her plight. Her talent as a musician and the music that is explained flies off the pages. I heard the notes in my head and played along with her. I am so lacking in knowledge of the great composers. Her privileged educated world is not one that you envy, in fact, Donnelly depicts the harsh realty; the drug excess, the vanity, the expectations, the recklessness. Andi is brilliant though doesn't look the part. Her father is distant and her mother is mad with grief. When her father takes her away to Paris to straighten her out, she only feels more strongly that she just wants to end it all. The story of Alex, told from her journal entries from Paris 1795, is heart poundingly good and vivid in description. I was dumbfounded by how much I did not know about the French Revolution (yeah, me!) and was horrified to read of the sadness and death that occurred. Donnelly weaves the stories of these two girls seamlessly. The placement of Alex's journal entries seemed very natural and went with the timeline of Andi's life and her emotional progress. Do I love everything I read these days? I am just on a really good streak! Boy I am feeling it with this one. Highly recommended! It really has everything. It has a tough as nails teen girl ready to break; French history, Classical and Modern music, love, loss, and dreams. Oh and I know the awesome readers at Teens Read and Write are picking this one up too so stay tuned for a review from them! You bet book clubs should read this. The history alone will fill up hours worth of discussion, not to mention the music and the angst. There is something so satisfying when you pick up an old book you've had on your shelf and you both hit it off immediately. There are no thoughts involved, no second guessing...it's just pure, go-from-the-gut decision making. I declared "I'm going to read this and I'm going to like it!" Yesterday afternoon as the little one napped, my husband and I snuggled (yes, really snuggled) down deep in our couch, threw a quilt over our knees and read together. His choice? The Basic Writings of Trotsky (he is still politically enamored with The Lacuna and needs to research). I found my pick to be a bit more cozy! AND it was snowing outside. How perfect! Garlic and Sapphires is a foodie's dream. I absolutely love to read food memoirs and haven't read many in a little while. Reichl's story starts with her life as the food critic for the LA Times. She gets a call from the New York Times with an offer to be their restaurant critic. Originally a New Yorker at heart, she really can't quite come to a decision about whether or not she is ready to go "home". After several attempts to "blow" the interviews (even though the job was already hers and the interviews were merely a formality), she decides that it would be an adventure for herself as a food lover and for her family; a journalist husband and a young son accompany her. She is not prepared for the brash treatment she receives from the city; the competitive nature of the restaurants, the reaction from the readers and the eaters and the rules she has to learn at her office. What she is prepared for, however, is to eat. She goes at it with gusto and tries to broaden her eyes and her reader's eyes to the diverse eating joys New York has to offer. It doesn't take her long to realize that her face is recognizable and life as the NYTimes restaurant critic is a celebrity existence, one that greatly alters her experiences in these restaurants. Hungry for the truth and hungry to show her readers what it would be like to really eat at these places, she decides to go in disguise. With help from her mother's elderly best friend, her office secretary and various theater friends, she creates her other personalities. Molly, a retired teacher who's husband makes it big in real estate. Miriam, a replica of her mother. Betty, an elderly quiet woman. This just names a few. The results are vastly different experiences in food and especially customer service. As Ruth, she gets the best. As Molly, she gets shoved in the back in the smoking section for an hour. As Chloe, she gets fawned over. As Betty, she gets ignored. Her adventures, though fun in nature, bring to light the dark side of critiquing expensive food. Is it only for the wealthy New Yorker? Why can't tourists looking to have a good time and spend some money be treated just as good? Why if you don't "look the part" you get ignored? As the book goes on, you read Reichl's transformation as a critic and her growth as a person. 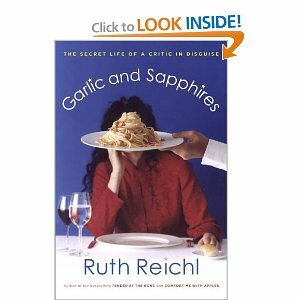 Funny, witty, and smart, Reichl is someone I would LOVE to meet and of course, share a meal with. She knows food and the business of food and it is evident in her writing because my mouth was watering the entire time I was reading. My husband unfortunately did not live up to the challenge of serving me Foie Gras! A gem of a book that I am so happy I dusted off for a cold, snowy Sunday afternoon. If you love food, memoirs or even New York, this is an adventure you would love to read about. Ruth Reichl went on to be the editor in chief of Gourmet and has written two previous books, Tender at the Bone and Comfort Me with Apples. According to some Google buzz, this is currently in development as a movie with a possible starring role for Catherine Keener! How exciting! It's been a few months since I've done the Hop, hosted by Jennifer at Crazy for Books. Stop by and join the fun. It's a great way to meet other bloggers. Each week she poses a question. I like to start at the beginning but I am really starting to hate not being able to complete a series. Like this whole Dragon Tattoo book. Good lord, it's like 5000 pages long and there are 3 of them. 3!! Soon to be 4!!! That's a lot of pressure!!!! I mean, I can't just read one, can I? Can I? Sorry, I'm feeling a bit expressive tonight I guess. ! In realty, I have not read that many series. I have really tried to stop obsessing about all of the middle grade and young adult series that have multiplied over the last few years that I have not gotten to. For now, I am trying to stick to Sue Grafton, Victoria Laurie, Leslie Meier, and a few others that write slow enough to keep up with. I haven't even read Mockingjay. Anyone watch the Country Music Awards last night? If you did, you may have seen the marvelous tribute to the wonderful Loretta Lynn. "Doo, you can't put the dog gone bedroom in the back of the house?" I have a crusty old copy of the book (seen above) and I can't quite remember when I read it but her, her story and her music make my heart warm. 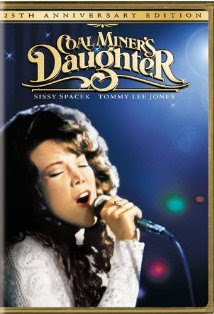 What was really fun to see was Sissy Spacek, who played Loretta in Coal Miner's Daughter, honor her in the tribute. 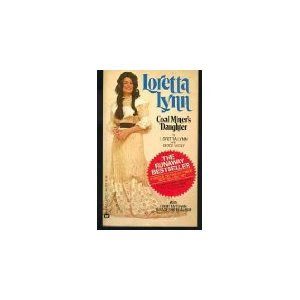 I was fortunate to see Loretta Lynn perform about five years ago at Mystic Lake Casino near the Twin Cities. I was, pretty darn sure, the only person there under the age of 50. I went with my Mom and Dad and felt so blessed to be in the same room as this living legend. I felt that much closer to my other country music hero, Patsy Cline. She was feisty, funny and still wickedly talented, even at eighty some years old. 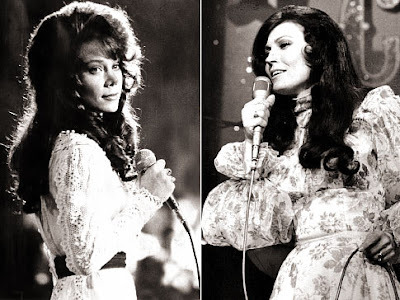 Here is a music clip of her singing Coal Miner's Daughter back in the 70s, a time I remember well. All those Conway Twitty and Loretta albums...sigh. Good times. For those of you new to my blog, my husband, Sean, has done a few Guest Reviews for me in the past. He does it when he wants and it's definitely not each book he reads. He is a very fast reader and churns through books when he has the time. (jealous!) He felt pretty strong about this one and asked if it would be okay to write a review. I said, by all means....He simply writes what he feels. He doesn't follow the same format that I do, with the rating system, book club note, etc. He does what he does. I am not normally a fan of books written in the form of letters or diary entries, as these usually read in a very contrived fashion.. using verbage nobody would actually include in a typical letter. However, the subject matter in this case managed to compensate for it. Told from the perspective of a young man, the story dwells in some historical events that, through the lens of popular culture, have become clouded or even erased from the history books. Though slow to start, I was intrigued to read this 'insider' account of these events. and later is employed as cook. In this capacity he meets such icons as Frida Kahlo, Leon Trotsky, and many other communist activists of the 1930's and '40's. This book skillfully illustrates how a person could be innocently embroiled in close personal relationships with "enemies of the state" and have little knowledge of the ramifications of such friendships in the face of the McCarthy agenda. I really enjoyed this book, primarily for the enlightening take on the subject of communism. History books always lump Lenin and Stalin as being cut from the same cloth, but this clearly shows that Lenin and Trotsky were completely different from Stalin, and illustrates some of the major differences between these platforms. I would recommend this book for anyone curious about depression- era economics, pre cold war relations with the USSR, and the role of communism in the Mexican revolution. "A meeting of the romance of Jane Austen, the social commentary of Charles Dickens, and the very contemporary voice of Posie Graeme-Evans, The Dressmaker plunges the reader deep into Victorian England in all its rich and spectacular detail." I must say, this turned out to be such a delightful read. I was immediately drawn to the gorgeous cover and the time period and setting. They are always favorites of mine. I liked it so much that I have decided to do a Giveaway of my copy. I have no system whatsoever when it comes to Giveaways. When I feel it, I do it. 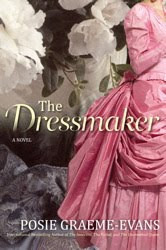 The Dressmaker opens up during the year 1843 in Norfolk, England. It is Ellen Gowan's thirteenth birthday and it is going to be splendid! Her father Reverend Edwin Gowan has invited many distinguished guests, many of whom are his pupils. Not a wealthy family but well respected in the community, Reverend Gowan teaches the young sons of many affluent families. When an encounter between one of these sons and Miss Ellen occurs during the festivities, the outraged mother of the boy pulls him from the Reverend's class. This swift move changes the future of the Gowan family, for when the news spreads, the Reverend is left without any students and no income coming in to support his family. I will not give away any spoilers but this event changes the fate of Ellen and her family. We follow Ellen from that day to her eventual success as a sought after dressmaker. In between we meet the disastrous and cunning Raoul, who would become her husband and almost her death; Oriana, her beautiful and giving older cousin; Connor, her first "love", Oriana's husband and ultimately her savior; Polly, her advocate, best friend and business partner; Connie, her darling mother and the host of English royalty she creates lavish dresses for. I found it to be a utterly absorbing read, in the way that Philippa Gregory is. It's filled with drama, expectation, societal rules, thievery, romance, love, lust, success, failure, family, honor and redemption. Ellen is a tough character but wears it with honor and pride. She is not forceful or fierce in her strength. She carries it quietly within. I liked that. I would say that goes for many of the female characters in this book. There were parts of it that were predictable. I could easily see where the story was going many times, especially the end. That didn't take away my enjoyment at all. By the time this came into play, I cared for the characters and was hoping for the best. This comes close to a full 6 star rating due to my enjoyment of it but falls a bit short with its predictability factor. Overall, it is a beautiful blend of history and romance, and I think any reader of both genres would love it. I know that when I work at my bookstore or library now, I will definitely recommend this to fans of Philippa Gregory. It has that same lush feel to it and it easily sweeps you away to a different time. I thought most about society and the rules of the classes and the rules for women in the late 1800s. This time period has always fascinated me. I think it would definitely stir up some discussion for book clubs. * Leave a comment with your email and maybe a favorite historical romance of yours. So a few short months ago I posted a little ditty about my love for Zac Efron. Well, I've got more crushes up my sleeve. I'm not going lie. I'm a 35 year old woman who is still a 12 year old crush crazy girl. Blame it on being a country kid with no friends. I found comfort in my little crushes. I would write stories about them, day dream about them swinging on my swing set listening to my little red boom box. Ahh...the sounds of Air Supply and Peter Cetera are coming back. Anyway, my husband is amused with my crushes and doesn't mind when I drool over them while watching a movie or a tv show or apparently writing silly little posts like this that really shows my dorky side. (Last example; watching Blue Bloods last night with Donnie Wahlberg and Tom Selleck. Oh Magnum Pi and a New Kid on the Block. Come on!! Let's talk about James Franco. First off, look at him. Oh, I will give you a minute. I started my love affair with James way back with the TV show Freaks and Geeks, one of the best damn TV shows ever made! Here's a favorite little clip of mine from there. I have since seen him in all of his movies; from the ridiculous Pineapple Express to the powerful Milk. He is gorgeous and talented and can do little wrong, in my eyes. And now he is a published author. See, I always tie it back in to books, right? Palo Alto: Stories is the name of his book. Have I read it? Not yet. Will I? Eventually. Or as I told my friend Cheryl, he could write the ABCs on toilet paper and I'd read it. Seriously, I read The Hottest State by Ethan Hawke because I was once crushin' on him. It can't get any worse than that. Sorry, Ethan. Hemingway you are not. Actually, I do have a wee bit more faith in Mr. Franco. I certainly don't want to discredit him and his writing abilities. So, check it out...the book that is. It sounds interesting. And you can stare at the gorgeous picture above of him while you read. Sorry James, you are just too darn hot. I am signing up for a Christmas Challenge. Like Halloween I only sign up for one holiday theme challenge at a time and well, let's be honest, I really try not to over "challenge" myself the whole year. I like to have fun and the holidays are a really good time to do it with my reading!! she is hosting this challenge. 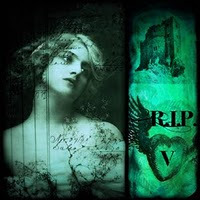 challenge will run from Friday, November 26, 2010 (Black Friday) through January 6, 2010 (Twelfth Night or Epiphany). cross overs with other challenges is totally permitted AND encouraged! These must be Christmas novels, books about Christmas lore or a book of Christmas short stories (sorry, no children's books, but YA novels are okay). 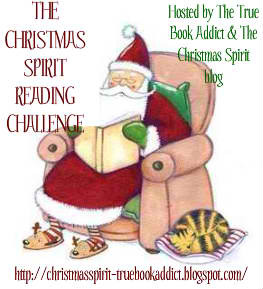 visit this POST for a list of new Christmas books for 2010. Also, Richard Paul Evans has a new book out this year, Promise Me. His Christmas books are among my favorites during the Christmas season. I have not decided what I am going to read or what level yet. 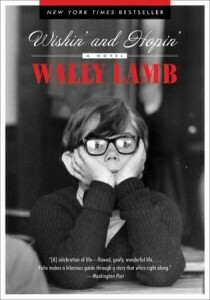 I know I will read Wishin' and Hopin' by Wally Lamb due to an already scheduled blog tour but aside from that...well, I'm leaving it open! I chose to read one spooky book for this year's R.I.P challenge from Stainless Steel Droppings and I finished it! The book was The Distant Hours by Kate Morton and it fit into the gothic category. It FINALLY comes out in stores next Tuesday so read my review and go buy it!!! Have I told you all how much I dig Dennis Lehane? Scratch that. 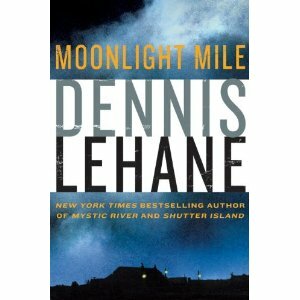 LOVE Dennis Lehane? I have been a fan of his since I read Mystic River many years ago. Luckily, I have read all of his books that have been turned into movies BEFORE I saw them in the theater. It's a must. His writing is so powerful and descriptive. It is necessary that you form your own ideas of the characters and settings before Hollywood does it for you. Don't get me wrong...there is little to complain about when you get Sean Penn as one of the leads in Mystic River and Leonardo Dicaprio as the lead in Shutter Island. They chose well. Casey Affleck as Patrick Kenzie in Gone, Baby, Gone, however? Dennis Lehane's new novel takes place twelve years after the events of Gone, Baby, Gone, (Loved the movie. Loved the book. Didn't quite love the choice of actors for the leads). It features private investigators Patrick Kenzie and Angela Gennaro. They are now married, have a daughter and trying very hard to make ends meet. With Angie in school, Patrick is forced to work as much as he can to provide for his family. Working freelance as an investigator doesn't pay enough and Patrick struggles with keeping his cool to finish the jobs. After being turned down for a permanent position because of his knack for judging his clients too much, he is approached by a person from his past. The past can be a tricky thing. Twelve years ago he rescued Amanda McCready from her kidnappers and brought her back home. Seemingly a noble, heroic thing, right? Well, those "kidnappers" were the loving, caring, older couple, Jack and Tricia Doyle. And her home? A cracked out, drunk, single mom Helene. Patrick has had to accept that what he did was the right thing to do, even though many at that time felt the exact opposite. The event broke up his relationship with Angie for over a year and put a mark on his chest he couldn't wash off. In the middle of it all was Beatrice McCready, the aunt of Amanda. Fierce and protective towards her, she brought Patrick on all those years ago and now she needs his help again. Turns out Amanda has gone missing again. Sixteen years old, wickedly smart and not afraid to run, Amanda has lived a life beyond her years. She has seen the worst and doesn't believe in the best. Patrick is ready to walk away but Angie is itching to get back in the game and make it all right. Being a stay at home mom and part-time student isn't giving Angie the edge that she got while doing investigating. She convinces Patrick to take the case and goes along for the ride. What follows is a slick, twisted slope into the world of Russian gangsters, fraud, drugs,vengeance and redemption. I love the characters of Kenzie and Gennaro. Patrick is strange, moody, big hearted, practical, cynical, madly in love with Angie and great at what he does. He knows his turf. He knows his boundaries...sometimes. He knows how to get a reaction out of people. Though you don't see as much of Angie in this one, you still feel her throughout; her strength, her wit, her humor, her edge, and her undeniable connection and partnership with Patrick. The events that take place are crazy to imagine but undeniably compulsively readable. I recommend it! I was excited to see it in my mailbox. It fit my mood perfectly. This is not a cozy mystery at all, though it's not as gritty as you may think. Patrick's character is so well seasoned in the seedy business of private investigating, that you easily roll with it all. And sometimes you are rolling into bad, bad news, my friends but doing it with really good back up. Recommended!! Start with Gone, Baby, Gone first to get a feel of what these characters went through together. It will help in understanding the way they interact now. This isn't for everyone and probably wouldn't generate much discussion. It's enjoyed best by yourself, with a beer and your feet up...perhaps with the Red Sox playing in the background. * I used to live in Boston during my 20s and I can not say enough good things about that city. Coolest damn place ever.